South Australia covers some of the most arid parts of the continent; with a total land area of 938.482 square kilometers (379.725 square miles), it is the fourth largest of Australia’s six states and two territories. To the south, South Australia is bordered by the Great Australian Bight and the Great Southern Ocean. This part of the state has a Mediterranean climate, with hot summers and mild winters. The main temperature range is 37°C (98°F) in January (summer) and 10°C (50°F) in July (winter). In the hotter parts of the state (outback), temperatures can be up to 50°C (122°F). The water temperatures generally vary between 24°C (77°C) in summer to about 11°C (55°F) in winter, which makes the temperate waters of the Southern Ocean, bordering South Australia ideal to dive in all year round. During Summer you can enjoy warm, calm days and during Winter you can enjoy crystal clear waters with amazing visibility. 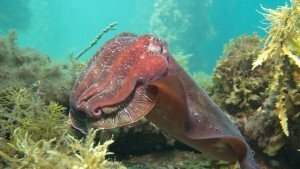 South Australia’s waters are among the most biologically diverse in the world and offer a great diversity of dive spots, from easy shallow shore and jetty dives for beginners, to deep wreck dives for the more advanced divers. Both shore and boat diving in South Australia can be terrific, especially as you can still see most elusive creatures (such as South Australia’s sea dragons) when shore diving. Look at our page on local marine life for more information about what you’ll be able to find in our waters! Besides life on the reefs, there’s a whole lot more to look at while you’re down here. With over 800 ship wrecks, South Australia is a great wreck diving location as well! The shipwrecks lie in varying conditions and depths and have a variety of entry points, some more challenging than others. They often form mini-habitats and harbour many different species of colourful marine life and show rare evidence of historic technology and life aboard the ship. If you’re interested in wreck diving, you can take a look at our calendar to see when we’ll be diving your favourite wrecks. If it’s not on our calendar at the moment, give us a ring at the shop and we’ll create an opportunity to dive it for you! Another typical South Australian way of diving, is jetty diving. South Australia’s many jetties make a haven for underwater flora and fauna. The pylons, covered with a spectacular array of invertebrates, diverse in colour and shape, provide a further treat. The Dive Shack’s house reef, the Port Noarlunga reef, is one of the most popular jetty dives, because of the large reef that’s at the end of the jetty. The reef is an aquatic reserve and has over 180 species of marine plants and animals! Other popular jetties include Rapid Bay, Wallaroo, Port Hughes and Edithburgh. The Dive Shack’s house reef, Port Noarlunga reef, is an aquatic reserve. Please remember that in South Australia, the collection of organisms is prohibited from all intertidal reefs to a depth of two meters and from within aquatic reserves. Diving conditions in South Australia can change with varying weather, tides and other environmental factors. Local knowledge is essential for most diving, so when diving a new location please check with The Dive Shack or contact the Diving Industry Association of South Australia Inc. for information on site conditions, safety regulations, license and diver rating requirements. Divers should note that diving on shipwrecks requires careful planning and an appropriate level of experience and training. Some diving locations require permits (such as the the ex-HMAS Hobart and the Zanoni) and all wrecks are protected by legislation. When taking one of the shipwreck trails feel free to dive, photograph and explore the wrecks. Do not interfere with them by disturbing or removing anything or anchoring on top of their remains. The Seadragon, a protected species, is both fragile and spectacular in appearance. 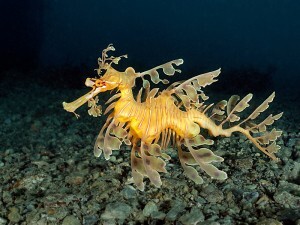 To assist divers to observe Seadragons a code of conduct called Diving with Dragons has been developed.